What will happen if I root my device? Will I still be able to update my tab to the official firmware updates that is released by samsung? Or my root will be lost once I updated it with the official firmware? Thanks! The..best phone + tablet with very smooth internet functions. Anonymous, 16 Sep 2012Thank you, but both url does'.nt work as there is no more support of adobe flash player in p... moreAm sorry, but i don't know any other player to work flash. It is supported by the tablet as for now it is not running Jelly Bean. So it should work on the tablet. Just try to find the Flash Player and install it. It should work. AnonD-71914, 16 Sep 2012Can Android 4.0.3 ics supports flash player or not....plz replyYes, Android 4.0.3 supports flash player. Which is the Best Recommended bluetooth for this tab2. I would prefer to have a stereo earphones which can be best used for listening music also. 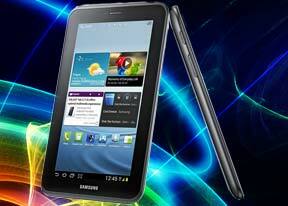 HARIOM, 16 Sep 2012samsung tab how i am rum internet with mobile sim card plz reply me Yes. Via built in speakers. TAB2USER, 15 Sep 2012you can also try this link, https://play.google.com/store/apps/details?id=com.adobe.flashplayerThank you, but both url does'.nt work as there is no more support of adobe flash player in play store , is there any other player with which i can see the videos from site . Can Someone tell me if is possible to receive calls on TAB270 P3100 without handfree?